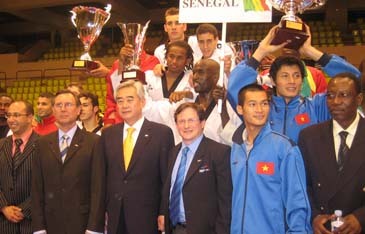 WTF President Chungwon Choue poses with taekwondo players and officials during the awards ceremony of the Prince Albert II Cup Taekwondo Tournament at the Stadium Louis II in Monaco on May 6, 2006. France won the team title of the tournament, which will be a biennial event. MONACO — WTF President Chungwon Choue attended the Prince Albert II Cup Taekwondo Tournament, which was held on May 6, 2006, at the Stadium Louis II in Monaco. The one-day event was jointly organized by the Monaco Taekwondo Federation and the World French-Speaking Countries Union of Taekwondo. The taekwondo competition drew officials and players from six French-speaking countries – Canada, France, Morocco, Niger, Senegal and Vietnam. France won the overall team title, followed by Morocco. Among the French players was Pascal Gentil, the bronze medalist of the 2004 Athens Olympic Games. On May 5, 2006 WTF President Choue was invited to the royal palace by H.S.H. Prince Albert II of the Principality of Monaco. Prince Albert II serves as a member of the International Olympic Committee and president of the Monaco Olympic Committee. "It is my firm belief that the Prince Albert II Cup will greatly help contribute to the dissemination and development of taekwondo in Monaco," said Dr. Choue in his congratulatory speech during the opening ceremony. Dr. Choue was actually supposed to attend the 3rd World Cup Francophone Taekwondo in Niger in November 2005. He said, "In our endeavor to ensure fairness in judgment and refereeing at taekwondo competition, WTF will conduct more field tests and research for the successful development of electronic protectors." He also expressed his appreciation to H.S.H. Prince Albert II for his efforts in making the biennial event a success. Prince Albert II is known for his love for sports. Among the participants in the event, which dates back to the mid-1980s, were Mr. Jean Bernasconi, president of the Monaco Taekwondo Federation; Mr. Roger Piarulli, president of the French Taekwondo Federation and the World French-Speaking Countries Union of Taekwondo; and Dr. Paul Viscogliosi, honorary president of the World French-Speaking Countries Union of Taekwondo. Also present were Mr. El Hadj Ide Issaka, president of the Niger Taekwondo Federation; Mr. Assane Ndoye, president of the Senegal Taekwondo Federation; Mr. Driss El Hilali, president the Morocco Taekwondo Federation; Ms. Christiane Laforest, president of the Quebek Taekwondo Federation; and Mr. Truong Ngoc De, secretary general of the Vietnam Taekwondo Association.